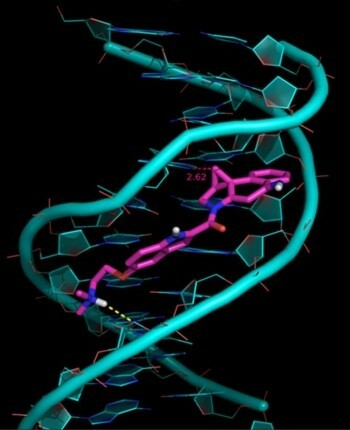 Cancer chemotherapy was founded on agents that interact with or alkylate DNA, and such compounds continue to be clinically important today. Their major limitation is a lack of selectivity, as they tend to target rapidly dividing cells which are present in but not limited to tumour tissue. Opportunities exist to enhance the therapeutic window of such agents by making them more selective – either by selectively targeting particular DNA sequences (oncogenes, transcription factors), or alternatively by selective activation in or delivery to tumour tissue. We have an ongoing interest in DNA alkylating agents of the cyclopropylindoline class – synthetic analogues of potent minor groove alkylating natural products such as CC-1065 and the duocarmycins. By substitution of a key phenol in the active pharmacophore with an amino group we have created a new set of DNA alkylating agents. 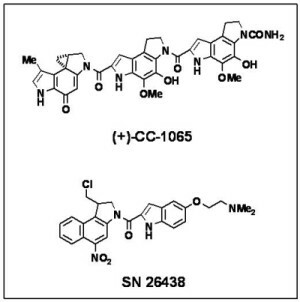 These have similar properties to the natural products (sequence selective alkylation at N3 of adenine and high cytotoxic potency) but lend themselves to the formation of prodrugs which can be selectively activated in the tumour microenvironment. For example SN 26438 is a prototype nitro prodrug which is activated by bioreduction and is selectively toxic to hypoxic cells in human tumour xenografts. Investigation of this and related compounds is currently being pursued under a New Economy Research Fund project in collaboration with Dr Frederik Pruijn of the Experimental Therapeutics Group. Fig 1: Molecular modelling of non-covalent binding of the spirocyclopropyl form of the natural enantiomer of the aminocyclopropylindoline derived from SN 26438, docked in an oligomer with a single high affinity duocarmycin binding site (d-(GACTAATTGAC) d-(GTCATTAGTC). Radiation-activated prodrugs, including quaternary salt and metal complex prodrugs of cyclopropylindolines. Sequence selective DNA cross-linking agents, for example agents combining cyclopropylindolines and pyrrolobenzodiazepines. The remarkable weight loss induced in mice following a single non-toxic treatment with particular cyclopropylindoline derivatives. This investigation is being carried out in collaboration with the Department of Physiology's Dr Kathy Mountjoy. Tercel, M., Atwell, G.J., Yang, S., Stevenson, R.J., Botting, K.J., Boyd, M., Smith, E., Anderson, R.F., Denny, W.A., Wilson, W.R., Pruijn, F.B. Hypoxia-activated prodrugs: substituent effects on the properties of nitro seco-1,2,9,9a-tetrahydrocyclopropa[c]benz[e]indol-4-one (nitroCBI) prodrugs of DNA minor groove alkylating agents. J. Med. Chem., 2009, 52, 7258-7272. Wilson, W.R., Stribbling, S.M., Pruijn, F.B., Syddall, S.P., Patterson, A.V., Liyanage, H.D.S., Smith, E., Botting, K.J., Tercel, M. Nitro-chloromethylbenzindolines: hypoxia-activated prodrugs of potent adenine N3 DNA minor groove alkylators. Mol. Cancer Ther., 2009, 8, 2903-2913. Milbank, J.B., Stevenson, R.J., Ware, D.C., Chang, J.Y., Tercel, M., Ahn, G.O., Wilson, W.R., Denny, W.A. Synthesis and evaluation of stable bidentate transition metal complexes of 1-(chloromethyl)-5-hydroxy-3-(5,6,7-trimethoxyindol-2-ylcarbonyl)-2,3-dihydro-1H-pyrrolo[3,2-f]quinoline (seco-6-azaCBI-TMI) as hypoxia selective cytotoxins. J. Med. Chem. 2009, 52, 6822-6834. Ahn, G., Botting, K.J., Patterson, A.V., Ware, D.C., Tercel, M. and Wilson W.R. Radiolytic and cellular reduction of a novel hypoxia-activated cobalt(III) prodrug of a chloromethylbenzindoline DNA minor groove alkylator. Biochem. Pharmacol., 2006, 71, 1683-1694. Tercel, M., Stribbling, S.M., Sheppard, H., Siim, B. G., Wu, K., Pullen, S.M., Botting, J., Wilson, W.R., Denny, W.A. Unsymmetrical DNA Cross-Linking Agents: Combination of the CBI and PBD Pharmacophores. J. Med. Chem., 2003, 46, 2132-2151. Tercel, M., Gieseg, M.A., Milbank, J.B., Boyd, M., Fan, J-Y., Tan, K.L., Wilson, W.R., Denny, W.A. Cytotoxicity and DNA interaction of the enantiomers of 6-amino-3-(chloromethyl)-1-[(5,6,7-trimethoxyindol-2-yl)carbonyl]indoline (Amino-seco-CI-TMI). Chem. Res. Toxicol., 1999, 12, 700-706. Tercel, M., Gieseg, M.A., Denny, W.A., Wilson, W.R. Synthesis and cytotoxicity of amino-seco DSA: an amino analogue of the DNA alkylating agent duocarmycin SA. J. Org. Chem., 1999, 64, 5946-5953. Atwell, G.J., Tercel, M., Boyd, M., Wilson, W.R., Denny, W.A. Synthesis and cytotoxicity of 5-amino-1-(chloromethyl)-3-[(5,6,7-trimethoxyindol-2-yl)carbonyl]-1,2-dihydro-3H-benz[e]indole (amino-seco-CBI-TMI) and related 5-alkylamino analogues: new DNA minor groove alkylating agents. J. Org. Chem., 1998, 63, 9414-9420.